As part of our ongoing work with the RaspberryPi Foundation, we’ve been working on a number of display-related topics recently. Besides the work done by my colleague Boris Brezillon on improving the kernel side support for a number of features (such as the GPU performance counters support, memory management improvements, etc. ), I’ve been working on improving the CI infrastructure for display driver testing. Indeed, the current workflow is not automated at all and doesn’t allow to detect breakages in the display driver. We thus needed to improve that. To do so, we’ve relied on a board developed by Google as part of the ongoing CI-effort on ChromeOS that is called the Chamelium. The Chamelium is based on an ARM board powered by an Altera SoC+FPGA platform that Google extended with an extension board with video connectivity: VGA, HDMI and DisplayPort. They then developed a firmware for the FPGA to allow the board to emulate a screen. Using this, you can simulate improper EDIDs, simulate hotplug events, HDCP screens, etc. and see how the device under test reacts to that. One of the interesting things you can do with it is to dump a CRC of the frame received on the display link, or a raw capture of a given number of frames. 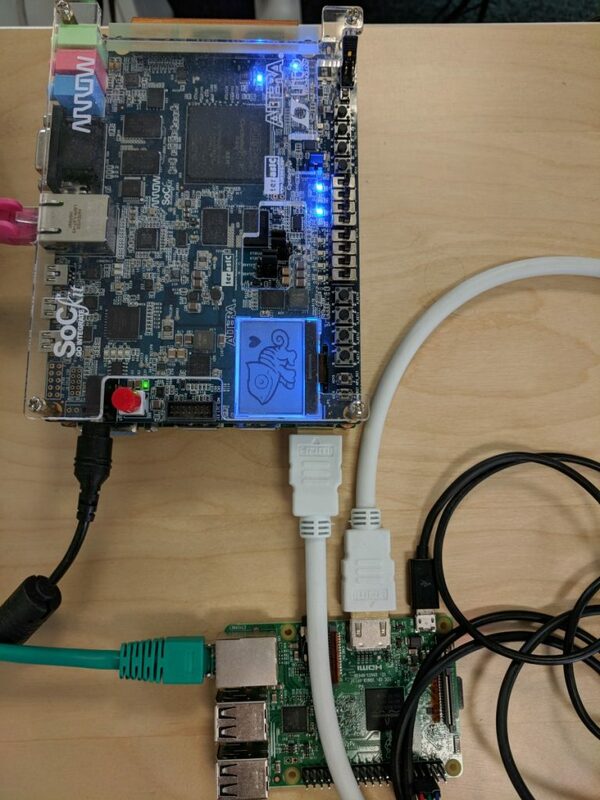 The usefulness of such a feature is obvious for a CI effort: you connect the device to test over HDMI, VGA or DP to the Chamelium, and then you can setup a test pattern on the device you want to test, capture the frame received on the other end, and compare the two frames. In an ideal scenario, the two are identical, and if your driver has a regression, you’ll notice as the two frames would no longer be identical. The intel-gpu-tools suite (also called i-g-t), even though historically named with a not-so-generic name, is a standard test suite for the DRM subsystem in Linux. Last summer, the support for the Chamelium has been introduced for exactly this setup, where intel-gpu-tools would setup a test pattern, ask the Chamelium for a CRC of the frames it received and do the comparison. This was working fine, and after a quick test on the RaspberryPi, it turned out to work on non-Intel hardware out of the box. However, the test was actually quite simple: while it was testing all the resolutions exposed, it was only testing a single pixel format, and we wanted to do more in order to catch regressions in less common formats, and ideally the RaspberryPi proprietary formats as well. the RGB formats, sometimes prefixed with an A (for alpha, the opacity) or X (for padding), and the YCbCr family (also called abusively YUV). The former will have different values for each primary color, encoded on a number of bits following the RGB prefix. XRGB1555 for example will be a 16 bits format (1 + 5 + 5 + 5), with 1 bit of padding, and 5 bits for red, green and blue in that order. the YCbCr formats, based on the property of the human eye that it perceives better the changes in luminosity than in color and will thus store the luminance (Y) and chrominance (Cb and Cr) in separate fields, with possibly a different number of bits. While RGB is usually preferred by computer graphics, video is very fond of the YCbCr formats since you can compress the Cb and Cr fields, resulting in a denser pixel format, without degrading the image quality too much. The format initially supported by intel-gpu-tools was the XRGB8888 (8 bits of padding, 8 bits for red, green and blue, in that order). The RaspberryPi supports the RGB formats XRGB8888, ARGB8888, ABGR8888, XBGR8888, RGB565, BGR565, ARGB1555, XRGB1555, RGB888, BGR888. Like we said, i-g-t was on the contrary using only an XRGB8888 format for the test pattern. This unfortunately was based on a few assumptions, the first one being that the test pattern would be generated with Cairo. However, Cairo supports a very limited range of formats. On the formats supported on the RaspberryPi, Cairo only supported ARGB8888, XRGB8888 and RGB565. This was obviously not enough, but we didn’t really want to extend Cairo since our goal was to be able to run the test suite on as many devices as possible. One option would have been to update the version of Cairo in use to support a larger number of formats, but that was not considered to be the most appropriate solution. We thus evaluated our options, and it turned out pixman supports most of the RGB formats, and it was already a dependency of intel-gpu-tools. All this work has then be submitted to the intel-gpu-tools mailing list for review, and while the development was done on a RaspberryPi, it should benefit the whole community.